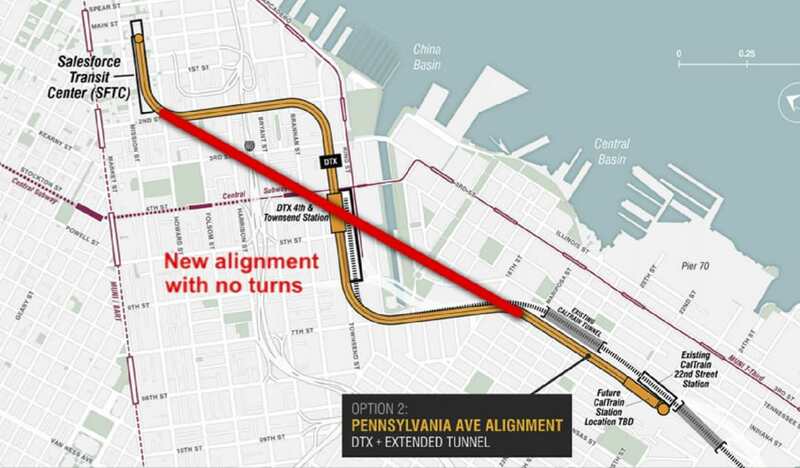 As we expected and first foreshadowed earlier this year, the San Francisco County Transportation Authority has officially adopted the Pennsylvania Avenue Alignment as the preferred path by which trains should reach San Francisco’s new Salesforce Transit Center, with the rail lines into the city now expected to be completely undergrounded starting near the current 22nd Street Caltrain station and newly tunneled to the Center. 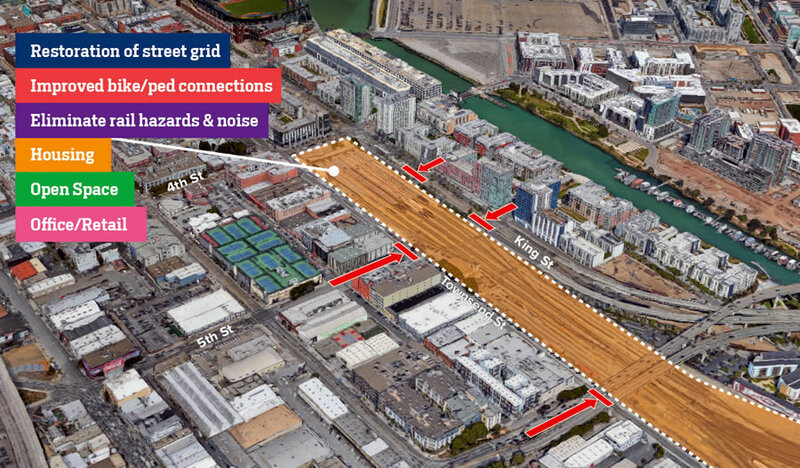 As such, the existing Caltrain station at 4th and King, which is the current terminus in San Francisco, would be undergrounded as well, the Mission Bay railyard could be moved south and a future redevelopment of the railyard site could yield over 2 million square feet of commercial development and up to 1.5 million square feet of residential space, based on current zoning alone. this is going to be so amazing, but i do find it a bit ridiculous that they are “assuming” all money is availible by Jan 1, 2017. ITS ALMOST 2019!!! WTH! so what do people really think? 2030? My goodness. The most convoluted and complicated route possible. Not even close. The Mission Bay route would have been significantly more complex and difficult. What do you expect when constructing a tunnel through one of the most densely populated and built corridors in the country? I would say the least disruptive to surface traffic, except of course for the fact that it largely lies underneath the existing CalTrain ROW; so only disruptive to that…the very thing they’re trying to improve. Not much of the route lies directly under existing ROW, or more specifically, existing track. Except for that it runs under Townsend St which will be an absolute nightmare construction-wise while still trying to serve the existing station. Luckily, Central Subway should be operating by then, so that will take the pressure of Townsend which currently host 30/45 lines coming via 5th St.
As we outlined earlier this year, along with a graphic, the TJPA is aiming to reduce the amount of cut-and-cover to “minimize surface disruption and socio-economic impacts,” albeit at a higher total project cost. And in addition to tunneling and construction, the projected budget includes an estimate for acquiring land, engineering, securing environmental clearances and the construction of a new southern railyard. Neither convoluted or complicated. Please, tell us which route is simpler. Three incredibly tight 90-degree turns to get into the station. Yeah, compare that to the sweeping fast turns BART makes through the city. This is going to be slow. Forever. All due to construction efficiencies, I assume, running under single streets. Not ideal though not as bad as you might think as the train has gotta slow down anyways as it approaches the terminal. There’s a similar problem that would have been easier to avoid down in San Jose where the tracks make an S curve around the new-ish Caltrain maintenance facility which could have been designed in a way to eliminate the S curve. Still not as bad as it seems as it makes sense for all trains, even HSR, to stop in SJ. The unfortunate slowdown isn’t at the terminal—obviously it slows down there. The sad part is the time wasted through 4th st. Rather than a quick stop as happens at 22nd, it will take more than a couple of minutes extra. Plus that distance is like a mile. Even at 25 miles per hour, the time between 4th and downtown is still only a couple of minutes. thats right anon2.5. I think this is a minor / non issue. I dont think its uncommon at all in major cities at terminus stations to see a slow roll in for the last few miles. Certainly. And the existing curve into 4th is no different. By your numbers I have spent 200 hours making that 4th street curve in my 10 years riding Caltrain. 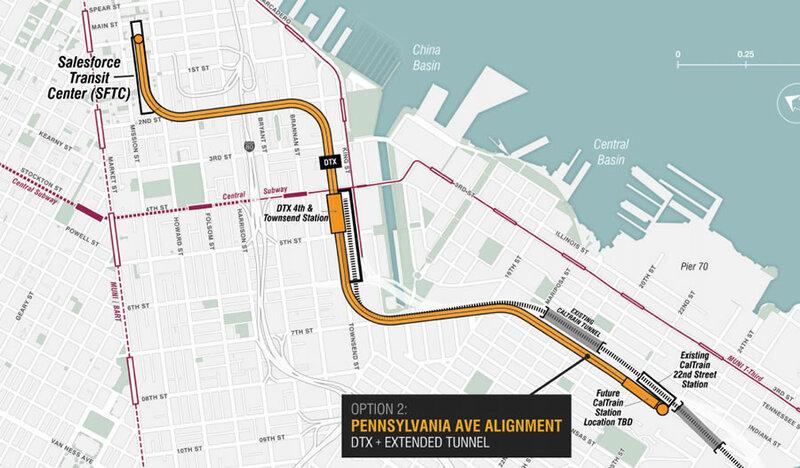 @Metroliner, how would you propose that the train get from 4th/King to the Transbay Terminal without two 90 degree turns? I’m not a transit engineer, but I would think something like this. It’s not an engineering problem, it’s a cost problem: as the link shows a “direct” approach would demolish hundreds of buildings (or it would have to be buried so deep that it would introduce the equally vexing problem of steep grades). The problem is trying to bring the HSR component to the TTC rather than just leaving it at 4th/Townsend: there’s a logic in having the tens of thousands of daily CT riders close to downtown, for long-distance passengers, not so much. Stellar, the only problem with your plan is that it’s impossible. You basically have to go under known streets. This is the problem with armchair engineers… Your “solution” takes absolutely nothing existing into account. Have you thought about how to shore up any building or road sitting above your hastily drawn line? Are you proposing digging diagonally through its foundation? You would need to dig up whatever is there to tunnel like that. That is why the path is directly under something that can be dug up. Have you considered any other utilities, sewer lines, etc… ? I can forgive ‘stellar’ his idle thoughts, which only engage SS’readers; more problematic are the other “not an engineer”s who sit on (government) boards, propose ballot measures, and get initial funding “prior to the potential alignments being identified, much less actually studied”…which may go a long way toward explaining why this project has seemingly tripled in cost over the past decade(below). Los Angeles sped up multiple Metro projects by several years with Measure M. The Bay Area could do something similar if it cared enough. “Do you really want to be worse than LA?” might be a more-compelling-than-you-think way to campaign for a large regional transit measure. Most of Caltrain’s service area covers 2 of the counties that withdrew from the BART district. That doesn’t mean the money can’t be raised. We’re the richest city in the Country, in the middle of a boom, we can find a way to afford putting a train underground. Richest? Ha. Most mismanaged, would be more like it. $10Billion in unfunded pension liabilities. This underground line will never be built in the lifetime of anyone reading this post. I think one underappreciated (at least here in the comments) aspect of undergrounding Caltrain is that we will have the chance to extend the N line up Townsend (or King) and Division adding much needed light rail to the Design District/Western Soma and connect it with the existing N line at Duboce. I do think that the 22nd stop should be shifted to be closer to 16th to improve access to the future warriors stadium and UCSF. There’s certainly some opportunity there which largely depends on what happens with the current Caltrain yards. Right now, Brisbane is planning on building some housing and office space on area where HSR was planning to store trains. Caltrain will need even more storage. I really don’t know where the 6 billion dollar cost estimate is coming from regarding the tunnels linking the new salesforce terminal with the caltrain tracks near potrero hill. Are they talking about two TBM tunnels costing between 4 and 6 billion? This was the cost breakdown for the two tunnels built for the muni central subway: The Tunnels contract was awarded in June 2011, to the Joint Venture of Barnard/Impregilo/Healy. 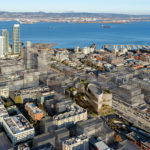 The $233.9 million contract consisted of 1.5 miles of twin-bore tunnels underneath Fourth Street and Stockton Street, from I-80 to North Beach. Most of the cost for the second ave subway, SF central subway, crossrail and such is for the stations. After laying the TBM tunnels, the contractor then cuts into them to construct the stations. Aside from the one underground station in the current caltrain terminus, the main station is already constructed. Anyone know where the fantasy, bloated price for the tunnels is coming from? The $6B is for the entire SF-SJ+ upgrade. Well then my apologies for the links – to government publications, including one from the JPTA, who would seem to be in a position to know (tho I admit experience doesn’t exactly seem to support the assumption) – which seemed to show just that…to me at least. You’re right, those were links to government publications, just the wrong ones. Perhaps SocketSite would care to provide a link to the quoted cost estimate?? Here’s a good place to start: Results of SF’s Railyard, Tracks and I-280 Redevelopment Study (which not only set the stage for the SFCTA’s decision but also includes a direct link to the alignment study summary document and projected costs). Well it certainly doesn’t suffer for want of numbers: I saw $4B (several times), and, finally $6.842B (pp25) mentioned (tho to be fair the former may have been for another version…which seems strange to cite repeatedly given that a final plan hadn’t been yet selected, but…whatever). OTOH given that pp2 tells us SF is projected to have (sic) .099M jobs in 2065, I’m not 100% confident much proofreadng went into this. And given that a “wrong” doc was citing ~$1-2Bish just a few years ago – tho God-only-knows what version they were referring to with that – it’s not entirely impossible we’ll see more – and (much) different – estimates…might even be one of those 100% probabilities. You should have kept reading to page 41. Typos happen. And believe it or not, referencing a document which quotes 2007-2013 era estimates, prior to the potential alignments being identified, much less actually studied, really isn’t the “right” approach and leads to some rather wrong conclusions and misstatements of fact. If the quoted price is $6 billion, the final price will be double that. Most likely after they start started in about 5 years or something ridiculous like that. If they are estimating a 2027 completion date, I’m going to say a more realistic conservative date is going to be 2030. 2030 isn’t conservative at all. Could easily slip 5-10 more years. HSR is going to stop in every podunk town with a state representative and will have about 75 stops by the time it’s built. It should only be a SF-San Jose-Sacramento-Fresno-LA-San Diego route. Palmdale? Merced? Why?? You know there are going to be express, limited, and local trains, right? Just like on Caltrain. You can expand connectivity and access for smaller communities while still providing express connection between hubs. It’s not a binary decision. No it isn’t. It’s not happening, so why design for it? It’s going to have to be pretty deep to tunnel under the sub-garage at The Beacon/Safeway. Cut through the garage… why not? According to the plans,there will be a three track cut and cover tunnel under Townsend Street.